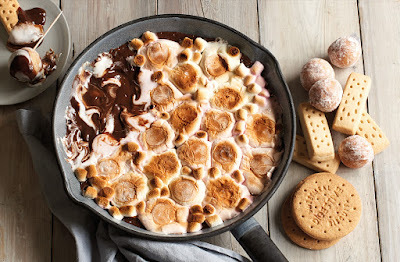 This moreish s’mores dip is the perfect treat to share on Bonfire Night or as a TV-night snack. A silky-smooth chocolate ganache hides beneath a layer of gooey toasted marshmallows, ready to be dipped and dunked with your favourite treats. Preheat the grill to high. Put both types of chocolate, the cream and condensed milk in a large bowl placed over a pan of barely simmering water, ensuring that the bowl doesn’t touch the water. Allow to melt for a few mins, then stir until smooth and glossy – add a splash of water if it seems to be sticking. Transfer to a medium ovenproof dish to create a thick layer, then cover with the large marshmallows. Scatter over the mini marshmallows to fill in any gaps (depending on the size of your dish, you may need a few more marshmallows to cover the chocolate). Cook under the grill for 3-4 mins until the marshmallows are melted and toasted on top. Serve with biscuits, fruits or small treats for dipping. 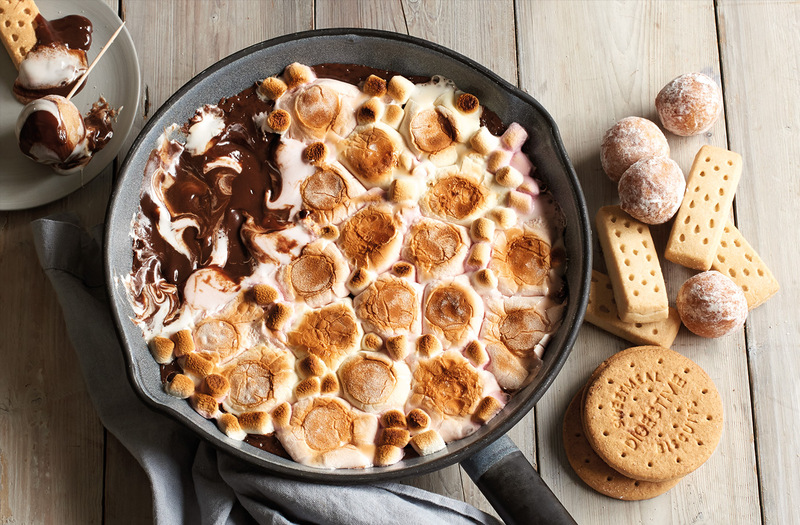 Tip: This recipe is easy to adapt if feeding a crowd – simply double the ingredients and cook in a larger ovenproof dish (such as a large pie dish) for one big sharing dip or divide the ganache and marshmallows between several smaller dishes or ramekins.